Freestylers Federica Pellegrini and Gregorio Paltrinieri each rose to the top of the world ranks on day 4 of Italy’s national championships. 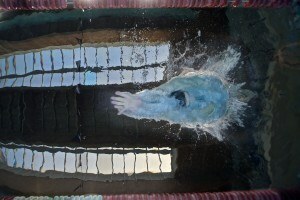 Pellegrini topped the 200 free and Paltrinieri the 1500. 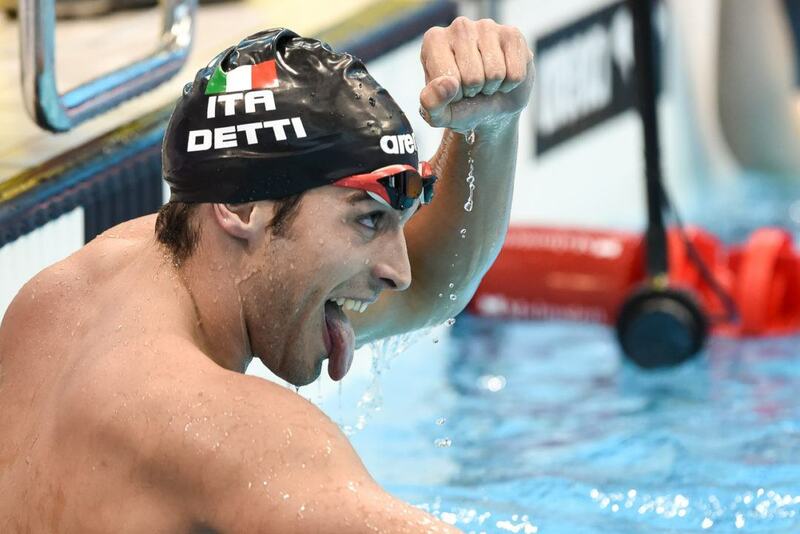 Detti went a world-leading 800 free, going 7:41.64 to break his personal best. Nicolo Martinenghi ﻿broke his second junior world record in as many days, going 59.46 to win the 100 breast at Italian nationals. 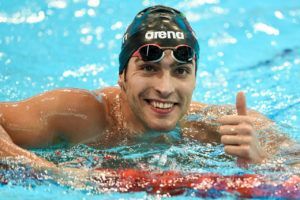 A talented field of men’s 200 freestylers stepped up to challenge Gabriele Detti at the 2017 Italian Championships, but the distance ace once again landed on top of the podium. Sprint studs Filippo Magnini and Luca Dotto shot off to the early lead with a pair of 51.2 splits to Detti’s 52.77 at the 100-meter mark. They were no match for Detti’s back-half speed, however, as he raced to a dominant 1:46.38 victory. Magnini (1:48.32) held on for 3rd behind Filippo Megli (1:47.38), while Dotto settled for 4th in 1:48.37. That time makes Detti the fastest man in the world this year. He’s now about a half second ahead of South Africa’s Chad Le Clos, who formerly headlined the rankings with a 1:46.84 from the South African Championships. On the women’s side, distance standout Simona Quadarella jumped to the top of the world rankings in the 1500 free. Quadarella won the race by nearly 5 seconds with her 16:10.66, as Giulia Gabbrielleschi finished in 16:15.56 for silver. Quadarella’s time moves her up to #1 ahead of Hungary’s Boglarka Kapas (16:12.86), while Gabbrielleschi moves up to #3 ahead of Kapas’ Hungarian teammate Katinka Hosszu (16:16.92). Also putting up a highlight reel performance on the final night of competition was Giacomo Carini. In the men’s 200 fly, Carini rocked a 1:55.40 for the gold, breaking his own former Italian National Record of 1:55.48. That time ranks him 4th in the world this year, and is just .4 behind Le Clos’ world-leading 1:55.00 from the South African Championships. Detti is such a fast closer. In 400 free in Rio, he went by the 2 Americans in final 100 to grab the bronze. He was closing on Jaeger in the 1500, but Jaeger held him off.